I don’t know…I am Danny! Thanks for listening to this episode of New Wax! Brought to you in part by GoDaddy.com, make sure to check out all our deals! As we open our show we learn that Joe is Gassy, but Luppy is good! We get some tips on food from our own Luppy, than he cooks some Chinese food. This of course leads us to talk Grocery Stores…what? Than we cover our first artist of the night…G6!He is a 24 year old rapper from Florida, with his new hit single and platinum artist pleasure p it is going viral ontwitter,youtube,any blog. It is currently #1 on rêverbnation…and ladies love it! It also seems Joe has a new project with Odds Lane, so stay tuned for more on that! Than we talk about Dragon aka Sean S.
Lawrence Sean Sibanda, also known as Dragg, or Sean S, is an up and coming hip hop/rap artist based in Kingston Upon Hull United Kingdom since February 2006. He was born in October 26th 1993 in the City of Johannesburg South Africa. While still in his home town, he had a serious illness which was mistaken for malaria due to the symptoms being similar at the early stages. The wrong medication was prescribed to him for 2 months when the doctors discovered he had meningitis, it was too late this resulted in the complete loss of his vision and partial hearing loss in his left ear. Dragg, aka Sean S, had been rapping since the age of 12 and was majorly influenced by West Coast rapper, The Game. 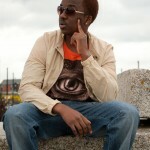 He is inspired by producers such as Ryan Lesley, Timbaland, Dr Dre, Rza, Swiss Beats, Scot Stotch. And finally…Luppy figures out how to sign off!! Who is Peter Parker & What Is In His Bag?? Help us learn about you! Surfing on the New Wax Podcast - Surfing Aliens on Who is Peter Parker & What Is In His Bag? ?